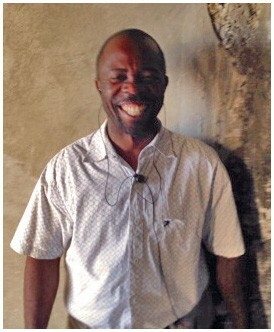 Bernard Eloud, 45, was born in Aux Cayes and moved to Port-au-Prince at the age of 16 to attend vocational school. He has worked in the building sector for over 25 years. He lives in Delmas 32 with his wife and two children, aged 8 and 10. Bernard has been participating in an on-the-job training program with Build Change, learning how to build earthquake-resistant homes. “Training has made me a lot more confident in my abilities and made me consider putting together a company. I hope it will help me find more clients,” explained Bernard. He has completed three homes with Build Change and J/P HRO, along with two others he acquired on his own. He just started two more homes in Pétion-ville and Carrefour. “One of the houses I did on my own I got because the client saw the Build Change retrofit project I was working on. All of these projects were important for me because it’s very difficult to find any work after the earthquake,” he said. Bernard is now registered as a qualified builder in Build Change’s network of trained construction professionals. He will also be listed as an available contractor and his information will be shared with other aid agencies implementing reconstruction projects in the area.